Investigative journalist Ali K. Chishti had a nightmare in Karachi on evening of August 30, 2013. He had been traumatized after being roughed up for around 10 hours after ‘uniformed Karachi police personnel’ abducted him along with his driver and handed him over to a group of people who appeared irked by his writings for one of the country’s leading weekly publications, The Friday Times, and foreign organizations about security and Karachi’s political law and order matters. It does have an extreme psychological effect when the captor tells the captive: “Prepare to die!” And Ali Chishti is no exception to have not been shaken by the captor’s threatening and demoralizing language and bullets fired close to his ears while being blindfolded. The case come to limelight when the new Pakistani government of Prime Minister Nawaz Sharif is taking stock of the country’s poor economic, dismal law and order and volatile border situations before suggesting any solution. Correct me if I am wrong – the prime minister has not taken any view of attacks on media practitioners yet. These attacks, of course, have been taking place much before his government came to power in May 2013. By the way, this post does not aim to discuss why the PM has not been noticing these attacks on Press. There is a far serious issue at home to be discussed first before looking at others to rescue us. In the first 8 months of 2013 alone six journalists have been killed – four of them in Balochistan province. Thirteen were reported killed in 2012 while 10 in 2011. Several of these journalists have been target-killed and some in bomb blasts or suicide attacks. In a small number of cases it is unclear whether their murder was related to their profession or the result of private dealings. The worse to come for the Pakistani media before the Chishti episode was when the mutilated body of journalist Abdul Razik Baluch was found in Karachi on August 21 after Baloch-language daily Tawar’s sub-editor was reported missing on March 24, 2013. Sadly neither the national nor the local media in Pakistan has taken either the Chisti or the Razik cases as big stories of attacks on media. Ironically, the Supreme Court also takes eyes off such cases involving attacks on the media. No suo moto action has ever been taken in regard to target-killing of any journalist. One journalist in Quetta city of Balochistan even adds the judiciary to the list of “predators” harassing the media in Pakistan. The Balochistan media calls the notices from the judiciary as the ‘third front’. It comes as rude shock why media owners’ body and journalists’ representative bodies have been silent on Chishti’s case. Why have they not condemned his kidnapping and torture? Why the media could not investigate who abducted Razik and why they killed him? The media houses look deeply divided. This division among their ranks is greatly disturbing in relation to fight against impunity of crimes against media in Pakistan. A united stand on the issue of attacks on press might have resulted in putting the brakes on these incessant attacks. The Pakistan Federal Union of Journalists – the country’s largest representative body of around 12,000 journalist members – has been agitating these attacks. In the cases of tribal journalist Hayatullah Khan and investigative journalist Saleem Shehzad PFUJ has forced the government to order judicial inquiry. But some critics have different view. “It (PFUJ seems preoccupied more with labor rights of its members than safety issues.” This view is substantiated with continued killings of journalists. As soul-searching, the PFUJ may be asked why safety issue has not been the top priority in its constitution/charter in the given situation. These questions do not attempt to undermine the organization’s rich history of struggle for the press freedom and freedom of expression besides labor rights of its members during the rules of military dictatorship but the organization has failed to take the case of attacks against media to court as a joint action. The issue of impunity and safety matters will stay the course unless fundamental policy change in both the owners’ bodies and PFUJ as well as the government approach take place. The media houses do not need to invest much on making safety and security issue of their staff top priority. What they can do is to introduce simply SOPs (standard operating procedures) on security while their respective staff will have to follow while working in hostile environment and dangerous places. Karachi itself falls in the category of dangerous places, needless to mention the Federally Administered Tribal Areas, Khyber Pakhtunkhwa and Baluchistan provinces along the border with Afghanistan. Security experts agree threat cannot be eliminated totally. But one can certainly minimize the threat level. Even this would be enough to prevent further deaths. Saving the lives of journalists is what is required. How can big media houses excuse themselves of the responsibility to hire a professional security manager to keep staff updated on security issues on daily basis using technology. Within days after the Marriot Hotel bombing in Islamabad a security team of BBC arrived from London to inspect its newly-furbished office, not far off the bombing site. And it declared the new office unsafe recommending its relocation immediately. And the BBC responded as per the security team’s suggestion. I guess no media house in Pakistan has hired any professional security manager or even carried security inspection of its offices in dangerous cities such as Peshawar or Quetta. It does not mean no media house can afford the monthly salary of such security manager. It is the will that is missing to keep journalists from being killed. At local level, journalists gathered both in Peshawar and Quetta to come up with own SOPs to save lives of their colleagues after their head offices remained indifferent to their security concerns. “We have been asking head office to relocate the office as its current location is extremely dangerous but the management appears unmoved by our repeated requests,” a journalist in of the two cities complains. Response of the successive governments, on the other hand, has been worse even. Of all the local journalists target-killed in Pakistan since 2000 no investigation into a single murder case of these slain journalists has been completed. This leads to a simple conclusion: we are killing journalists by not keeping them safe. 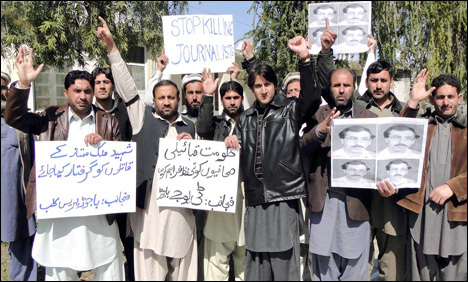 Image caption: Tribal journalists protest murder of their colleague, Malik Mumtaz Khan. The tribal journalist was killed on 27 February 2013 in Miranshah town of tribal district North Waziristan.